You are invited to the Oxnard Fire Department and Oxnard Firefighters Foundation fundraiser for Ventura County Ribbons of Life. 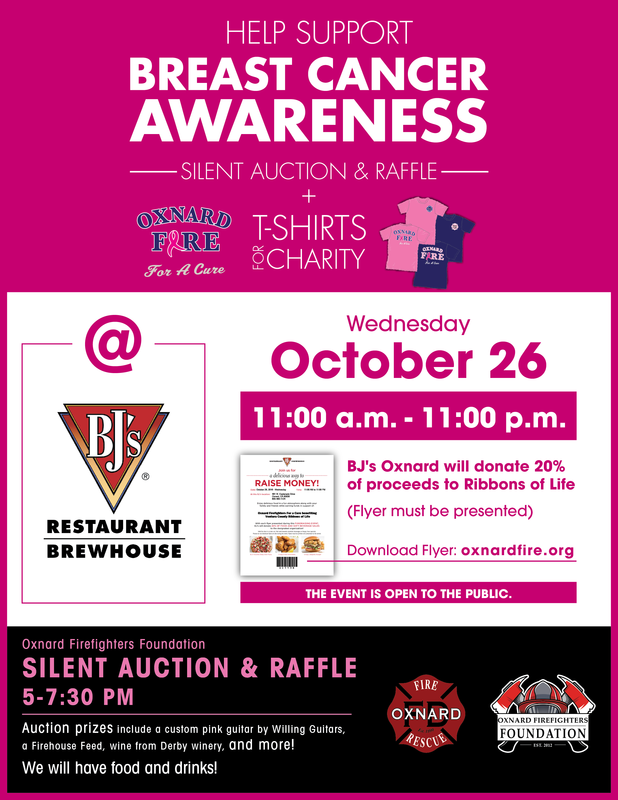 BJ’s Restaurant and Brewhouse will donate 20% of food and soft beverage sales to Ventura County Ribbons of Life on October 26. Download the flyer to participate. The Oxnard Firefighters Foundation will have a silent auction with a pink custom-made guitar by Willing Guitars, a Firehouse Feed, wine and tastings from Derby Winery in Paso Robles and much more. Stop by between 5:00 and 7:30 to participate in the festivities including raffle prizes and pink t-shirt sales. Download the BJ’s Brewhouse flyer here.